No matter how good your server is, system failures are unpredictable and ultimately inevitable. Whether it’s a malicious attack, fire, flood, or any other disastrous event, operational interruptions can lead to extended periods of downtime if you’re not prepared. Total Computing Solutions understands how detrimental these systems failures can be to your company’s reputation, productivity, and bottom line. That’s why it’s so important to make sure you have a business continuity plan that ensures minimal downtime in the event of a system failure. Local Backup System: We will integrate a local backup system into your existing network based upon Retrospect backup software. We provide you with server grade external hard drive media along with a rugged carrying case for off-site rotation. Online-Backup: We partner with DataGuard Hosting to provide you with a safe and secure online storage space to backup your most important data in the event on a system failure. We use the online backup to supplement the local backup system, giving you the added confidence that comes with remote data storage. Virtual Server and Workstations: We’re able to virtualize your server and user workstations, so that when disaster strikes, we can quickly recover your systems to their previous state. Virtualization of servers and workstations also allows for increased security, better utilization of available processing power, and a general increase in the efficiency of your company’s IT infrastructure. 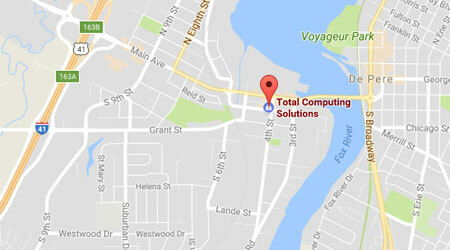 Contact Total Computing Solutions at (920) 569-2681 or e-mail us at service@tcsdepere.com to speak with a member of our team about how we can keep your business up and running, no matter what type of disaster comes your way.